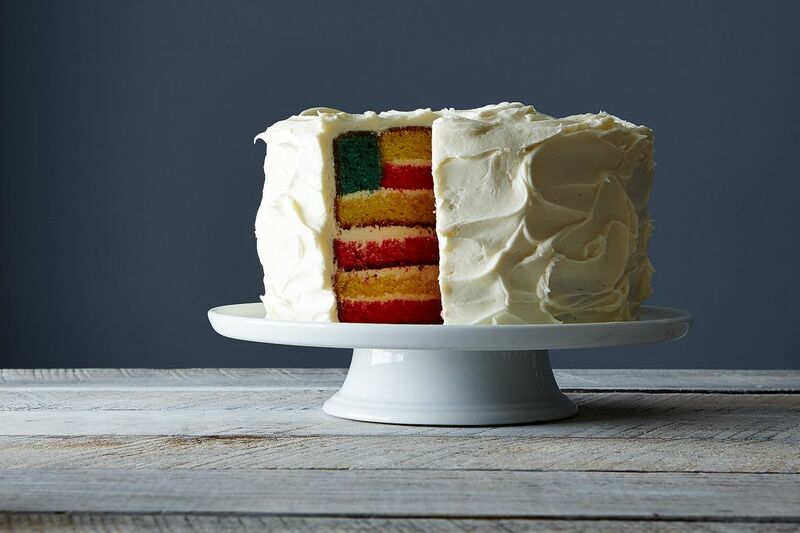 Today: Our Test Kitchen Manager Erin McDowell's flag cake was such a hit at our summer barbecues last Fourth of July, we had to share it again. For a recent Shop photo shoot, we made a flag cake. It’s just a simple vanilla cake slathered in a healthy layer of buttercream, but it’s layered to look like a flag, meaning that every slice you take out results in resounding gasps from hungry onlookers. When emails started pouring in asking how to make it, we couldn’t resist sharing a tutorial. After all, everyone deserves the “ooohs” and “aaahs” that you get when a piece of this beauty slides onto a plate. So we made another flag cake, and it came together just as quickly—meaning the first time around wasn't just beginner's luck. 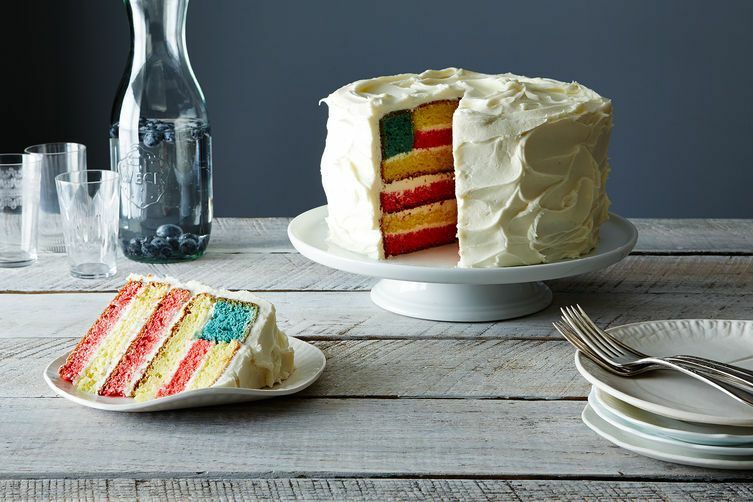 This is an easy project that results in a seriously impressive showstopper of a layer cake; make it for your World Cup parties (go U.S.A.! ), then make it again for the Fourth of July. Full disclosure: This patriotic cake requires a little extra effort (you do need to bake five cakes). But after that, it's as simple as cutting circles. 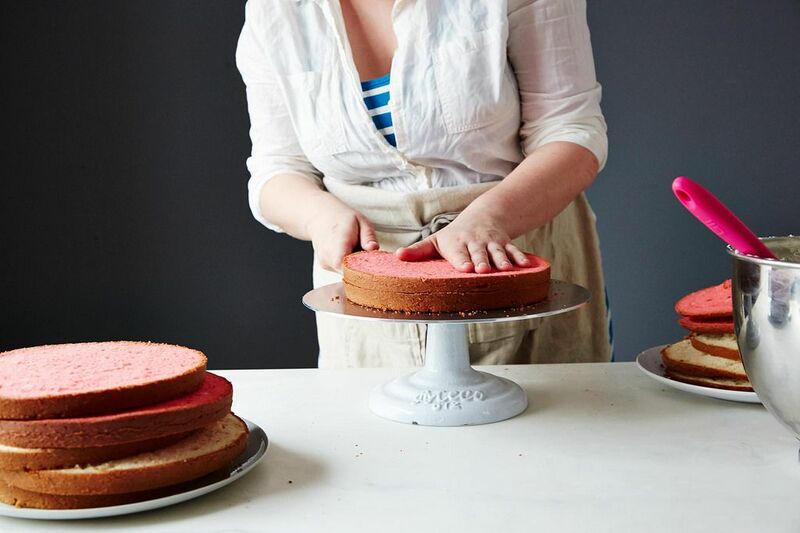 Start with a simple white cake recipe (I like the recipe below, which tastes like boxed cake mix in the best way), and use it to bake five 9-inch cakes: two white, two red, and one blue. Bake your cakes, using about 25 drops of food coloring for the red cakes and about 20 for the blue cake. Let them cool in their pans for 15 minutes, then invert them onto a wire rack to cool completely. While they cool, make your frosting: In the bowl of an electric mixer fitted with the paddle attachment, cream the butter and sugar until they're light and fluffy, about 5 to 6 minutes. Beat in the vanilla, then add the cream gradually, mixing until you get a smooth, creamy texture. 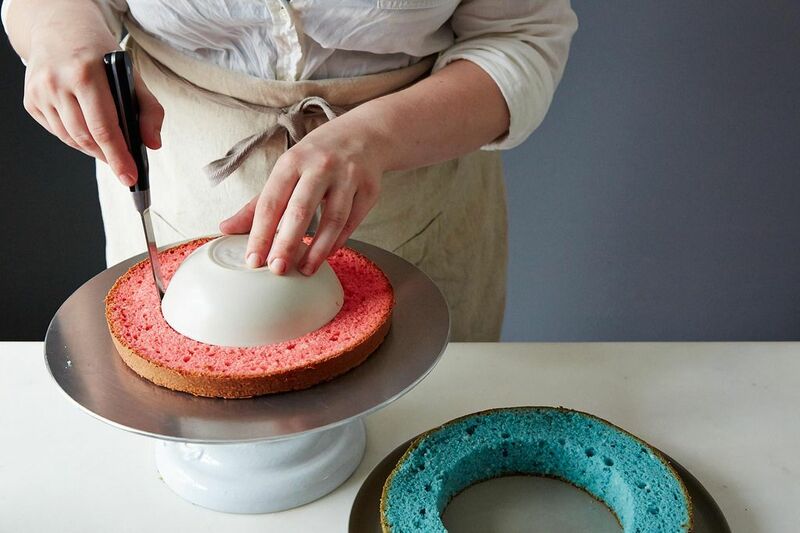 Then, use the same technique to cut a hole in the center of the blue cake. You won't need the inner blue circle, so set it aside. More: You could also turn your cake scraps into a bonus trifle. 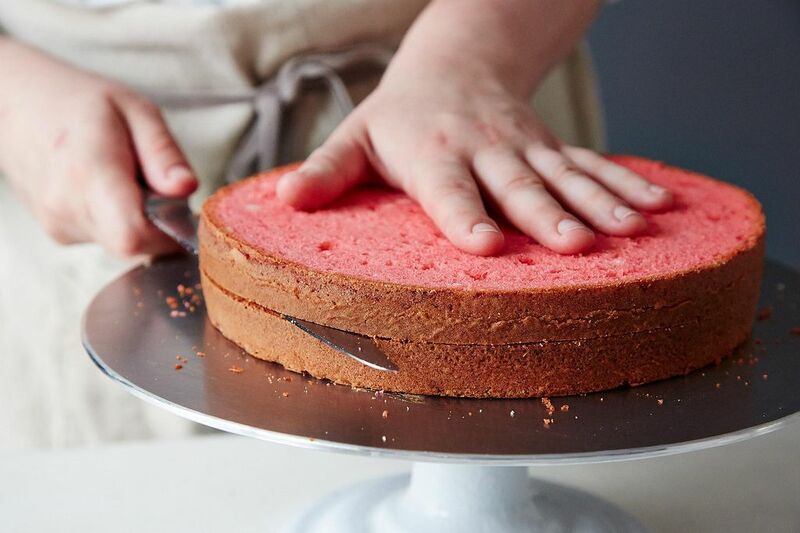 To build the cake, start with a red layer and top it with a thin coating of frosting. The key is to make it thin, otherwise you will interrupt the "stripe" effect. Top the red layer with a layer of white cake and another thin coating of frosting. Repeat with another red layer and another white layer so that you have four layers total. 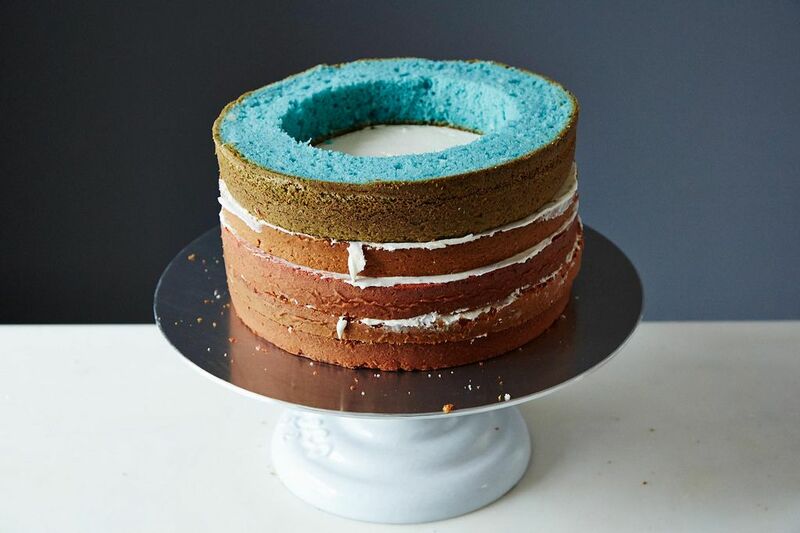 On top of this, place the blue cake doughnut (the thick layer with a hole in the middle). 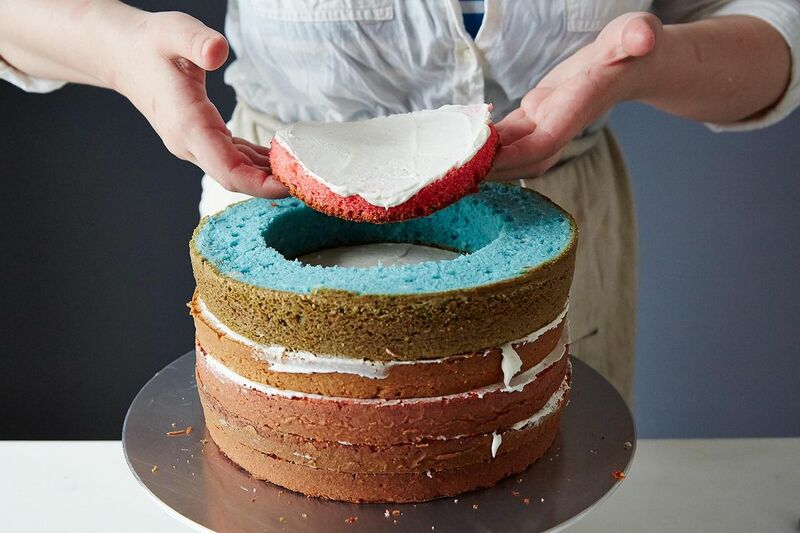 Spread a thin layer of frosting onto the small red circle, and insert it into the hole of the blue cake. Top it with a thin coating of frosting and the small white circle. 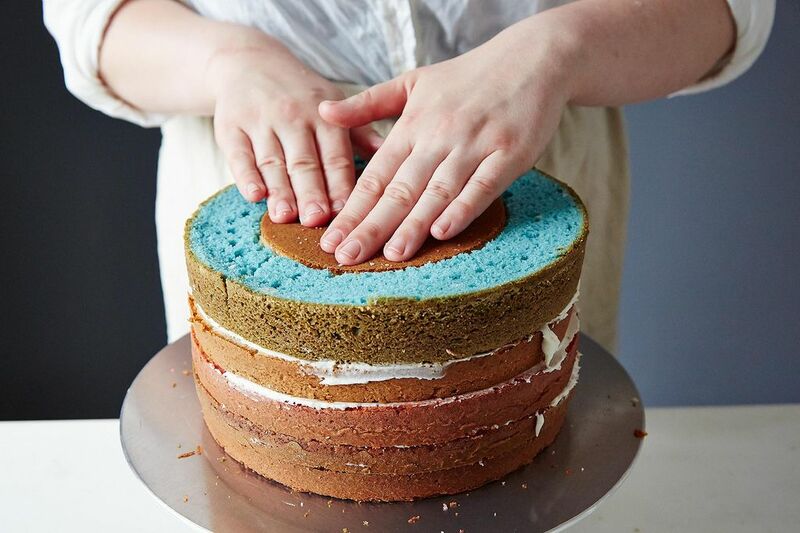 Gently press the small layers into the hole of the blue cake. Now you're golden. 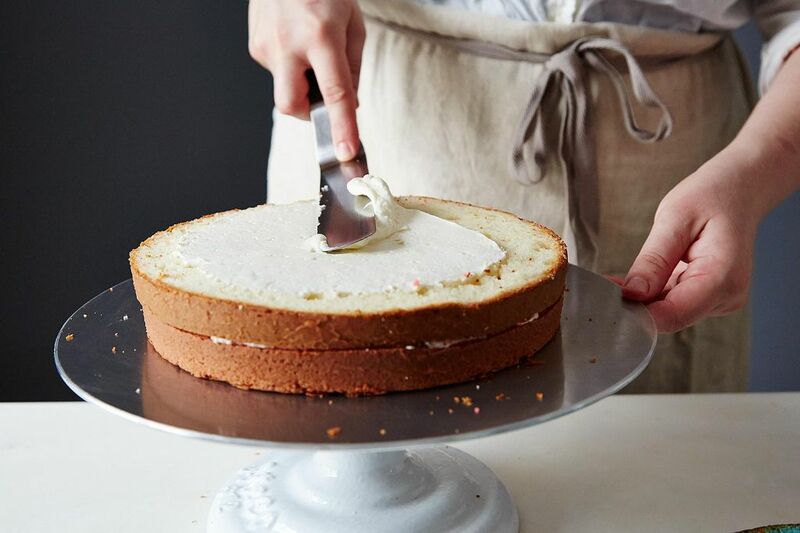 Frost the cake with creamy frosting using a small offset spatula -- be sure to make it swirly. The cake will look lovely from the outside, but the real kicker is when you cut into it! Make sure there's a hungry crowd nearby to watch. 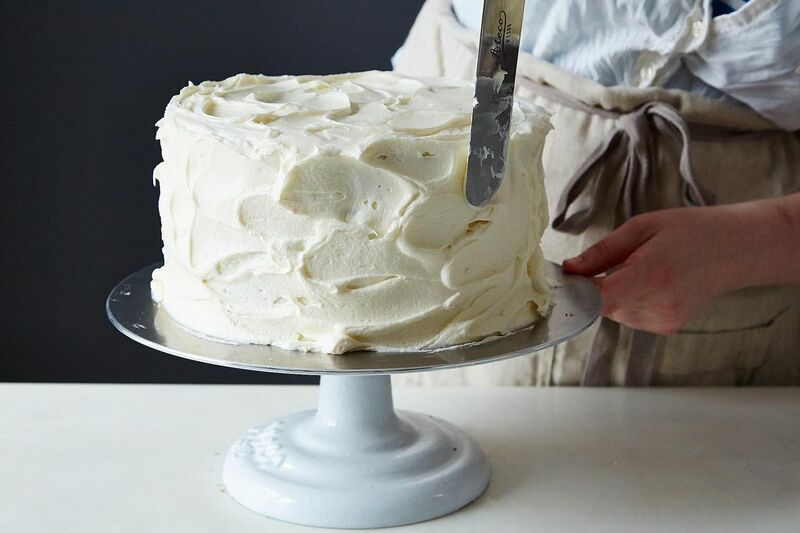 Does this finished cake (or, more specifically, the frosting) need to be refrigerated? Would it be okay to frost it the night before eating it and to leave it out overnight? I will try to make this cake but I admit that i strongly dislike cake flour. I will thus replace with this formula that I use all the time with great success. 1 cup cake flour = 3/4 cup (12 tbsp) all purpose flour plus 2 tbsp cornstarch. So for 1 1/2 cake flour, I will instead use 1 cup + 2 tbsp all purpose flour and 3 tbsp cornstarch. Cake flour?? do you mean plain or self raising?? What is the weight of a stick of butter please?? Table spoons of butter are, also, unless you are using melted butter rather difficult to determine?? Cake flour is different from self rising and plain. There is a pretty common brand called Swans Down. Cake flour is lighter and really does make a difference. Sorry I can't help with the weight of butter. Such a fun and festive cake for the 4th! And easy, the assembly directions were spot on! I wish I had time to bake the layers from scratch as I am sure the cake would have been even more spectacular but decided to take a shortcut. I used a vanilla boxed cake mix - 3 boxes. 8" pans because I wanted to bake 6 cakes at once in my oven using the convection setting and I could not find 9" disposable pans at the grocery. I cut a 4" ring instead of 5". For frosting, I do not like store bought so I followed the buttercream recipe but swapped 1/4 c half and half for the heavy cream as I did not have it on hand. Lots of oohs and aaahs and yums. A winner! Thanks for a fun project on a rainy 4th! Susan, if you decide to use a cake mix, just understand that there are some people (the supertaster variety) who can taste - and smell - the preservatives in cake mixes. Many people apparently can't. My next door neighbor can simply smell a batch of brownies and tell you if they are made from a mix. Those of us who can taste the preservatives in cake mixes don't think the cakes they make taste very good as a result. I don't mean to add yet another criticism to this recipe but this isn't a white cake. This is is a yellow cake since the entire egg is used not just the whites. Dont judge me, put can I substitute white cake mix? I followed the recipe to the T. Baked layers in 9" x2" rounds. Cakes are barely 1-1/4 " tall. I feel like they will be too thin if I cut them in 1/2. After 4 hours of baking, not thrilled to have to bake additional cakes. Alison, I wonder if you made the same mistake I did the first time I tried this. I baked only using the ingredients and did not see the link to the actual instructions. The front page ingredients list shows that the buttermilk goes into the icing, when in fact it goes into the cake. When baked without buttermilk the result is a flat, chewy, blond-brownie like result. Tastes good but cannot be cut in half. Also be sure you are using the proper size pan. Thanks for the reply! I added the buttermilk to the cake and baked them in 9" rounds as suggested. Maybe I'll try 8" rounds next time. I'm going to make a third red cake and then piece it together as best I can. I'm sure it will be fine and festive. Happy Fourth! I think I'll try the paste or gel food coloring from my local cake baking store next time to see if there is a difference. This cake gets 4 stars for design but I wasn't thrilled with the taste results. I made no alterations to the recipe. Super delicious and impressive cake! Everyone loved it. I doubled the recipe for the white and red layers and it worked beautifully. Thanks for the great recipe. The buttercream is DIVINE. I can't find where I asked my original question. But I've found this site that gives visual instructions. I didn't realize how much of a visual learner I am. LOL Thanks for your patience of my original confusion. Made this and made a happy mistake. I added another red (half) layer (you'll have it on hand anyway) before doing the blue ring and then I reversed the circles to have red on top. This accomplishes what Krysia suggested - giving red on top and bottom - and results in less cake left over. Only thing is that the icing just barely covers all, so next time I will make a tad extra icing. Also, another accident - I made a double batch of the blue layer - which allowed me to make an extra tall single layer of blue. This helped the proportions be more realistic. I think it would be great to make strawberry layers for the red cake, so you could use less food color and add another flavor to the totally vanilla cake and icing. Some strawberry puree or jam would probably work. One additional tweak would make it look even better: Change the order of the red and white layers so that a red layer is on the top and another red one on the bottom. If you look at the American flag, it always has a red stripe at the top and another at the bottom. You would need to cut out one white layer or bake another red layer to make it come out this way. Such a pretty cake for a Fourth of July party. Most of us have difficulty cutting a cake into 2 layers with a knife. It is very difficult to cut straight. As a teen I learned a neat trick to assure layers are always split evenly. 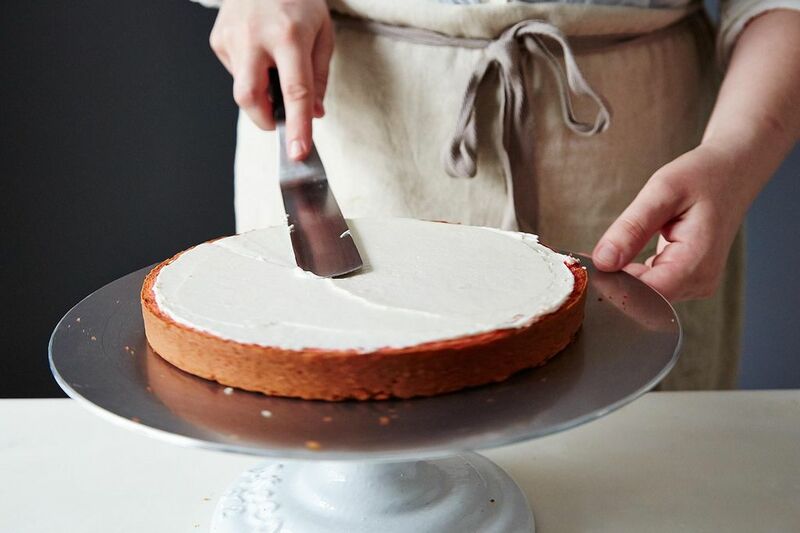 Instead of using a knife, cut a length of sewing thread long enough to reach around the cake layer and enough extra to hold onto the ends securely. Then wrap the thread around the circumference of the cake, making sure it is in the middle of the depth of the layer all the way around. Cross the ends where they meet and gently pull the thread ends to close the loop and cut through the layer until you can pull the loop out. Voila! you have a perfectly divided cake layer; now 2 layers. I love this idea! I use toothpicks all the way around as a guide and that works reasonably well but this sounds like it could be even better. I suppose you could try (unflavored) floss too. Yes, thin floss should also work. I am in my late 60s. But as a teen I was frequently approached by a couple of neighborhood guys who would ask me to bake them a Boston Cream Pie if they purchased the ingredients. I always said, "yes". Betty Crocker made a Boston Cream Pie mix. Boston Cream Pie is actually a single layer of yellow cake with the layer split and pudding placed between the layers and then the whole think has a drizzled chocolate frosting. I always used sewing thread to split the single yellow cake layer. If you don't have more than one pan the same size, and you don't want to spend a whole day with the oven on, bake the cakes ahead of time and freeze the layers until you are ready to assemble the flag. Or, if time is short, order red velvet cake layers and white cake layers from the supermarket bakery (I've done this before). Then all you have to do is bake the blue layer. 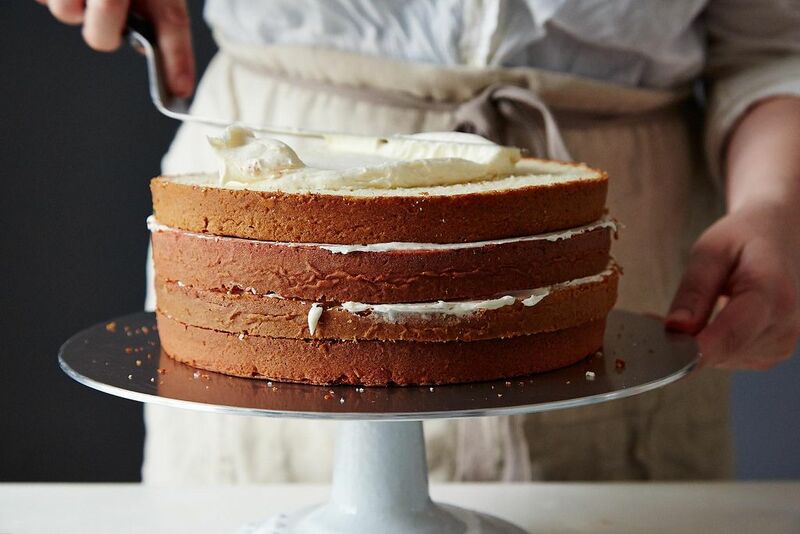 How long do you cook each layer of the cake for? Yes, please, how long? I'm guessing about twenty minutes? OK I think I already have two orders for this cake (though for separate occasions, because otherwise that would be a great way to use up the scraps)! Do you know if the cake recipe can be doubled? I.e. could I double the recipe for the red, again for white, and then use the single recipe for the blue?